This page lists publications that contain information on the question under discussion. These are on the one hand printed publications generally accessible, on the other hand old manuscripts. In the meantime many of them have been digitised and can therefore also be viewed. More articles on the subject that have been published in Media are listed separately. Blondel, David. 1657. De Joanna Papissa. Amsterdam. Kerner, Max, und Klaus Hebers. 2010. Die Päpstin Johanna. Biographie Einer Legende. Köln, Weimar, Wien: Böhlau Verlag. Spanheim, Friedrich. 1736. 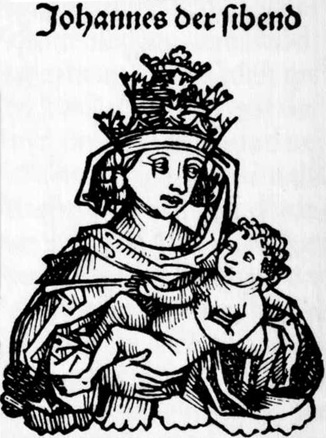 Histoire de La Papesse Jeanne. Troisième. Den Haag. Digitalised version. Morris, Joan. 1985. Pope John VIII, an English Woman, Alias Pope Joan. London. The book appeared 1985 in a small private edition and is rare to find. Only a few have the chance to read it. Habicht, Michael E., and Marguerite Spycher. 2018. Pope Joan [2nd Ed. ]: The Covered-up Pontificate of a Woman or a Fictional Legend? 2nd ed. Berlin: epubli. Amazon. Gössmann, Elisabeth. 1994. Mulier papa, der Skandal eines weiblichen Papstes. Zur Rezeptionsgeschichte der Gestalt der Päpstin Johanna. Iudicium-Verlag, München. Very important book with excellent source texts and information. Less suitable as a book for beginners, you have to be familiar with the topic before you can understand this scientific work. Ratto, Pietro. 2004. La pagine strappate [The pulled out pages]. [New subtitle: The tricks of the Renaissance Church to remove the historical story of Pope Joan]. The book is easily available in different languages and editions. It is the ideal book to get into the topic of Popess Johanna. Habicht, Michael E. 2018. Pope Jaon. The covered-up pontificate of a woman or a fictional legend? 1st ed. Berlin: epubli. Bestellungen. Habicht, Michael E. 2018. The Coins of the Popess. Summary in Englisch. Habicht, Michael E., and Ratto Pietro. 2018. Le Monete Della Papessa. Summary in Italian. Bartolomeo Platina (German version of 1604) Päbstliche Chronica B. Platinae. Das ist, Historische Beschreibung aller vnnd jeder Päbste, so von S. Petro an, biß vff den itztregierenden Pabst Clem. VIII. den Stul zu Rom besessen. (1604) Pages 191–196. The links may change or be removed at any time. The authors have no influence on these external links.